Radarsign’s Safety in a Box™ is a complete radar speed sign solution. This all inclusive sign package has everything needed for installation except the shovel and the concrete. All that is required is digging a hole, pouring the concrete, and installing the sign. It’s that easy. 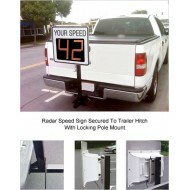 The Radrsign® Mobile Patrol Stand A radar speed sign mounted on a Mobile Patrol Sta..
Radar-on-the-GO Trailer Hitch Mount System Featuring the TC-400 a battery powered r.. 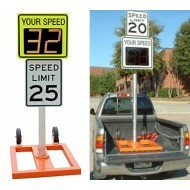 The TC-1000A is a 17" LED display speed radar sign. Radarsign’s built for purpose d.. 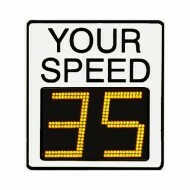 The TC-600 is an 13" ″ high super bright amber LED display speed radar sign. Radars..